Looking forward to discussing “The Jesuits, the Souls of Slaves, and the Battle for Saint-Domingue, 1720-1730” with the Boston College Legal History Roundtable this coming Thursday. This entry was posted in Conferences and Lectures, Events, Haiti and tagged Catholic Church, Haiti, Jesuits, Saint-Domingue on February 13, 2017 by mghachem. Here is the exciting program for the conference in honor of my great teacher Keith Baker at Stanford this coming weekend. 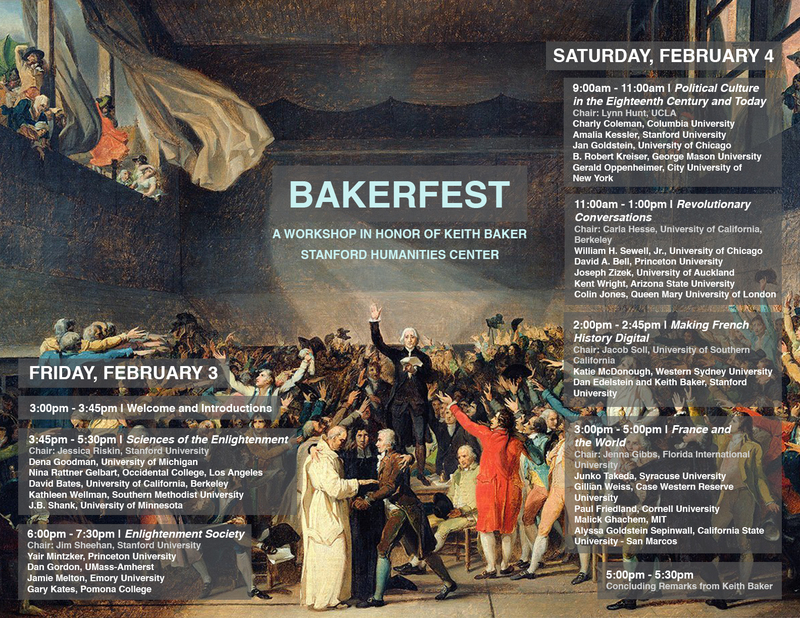 This entry was posted in Conferences and Lectures and tagged bakerfest, French Revolution, Keith Baker on February 2, 2017 by mghachem. “The University of Southern California Center for Law, History & Culture, UCLA School of Law, Columbia Law School, and Georgetown University Law School invite submissions for the tenth meeting of the Law & Humanities Junior Scholar Workshop to be held at USC School of Law in Los Angeles, CA on June 8 & 9, 2014. Submissions (in Word, no pdf files) will be accepted until January 6, 2014, and should be sent by e-mail to: Center for the Study of Law and Culture, culture@law.columbia.edu.Please be sure to include your name, institutional affiliation (if any), telephone and e-mail contact information. For more information contact Cindy Gao, 212.854.0167 or culture@law.columbia.edu, and to see past winners go to:http://www.law.columbia.edu/center_program/law_culture/lh_workshop. This entry was posted in Conferences and Lectures and tagged law and humanities on September 25, 2013 by mghachem. 2013-2014 promises a number of exciting new conferences and lectures on the legal history of the Atlantic revolutionary era. Coming up very soon (Sept. 12-14, 2013) is this conference in Paris, “Colloque Rev-Loi : La loi en Révolution 1789-1795. Fonder l’ordre et établir la norme,” at the Archives nationales and the Université Paris I (Panthéon-Sorbonne). You can find a PDF of the program here. 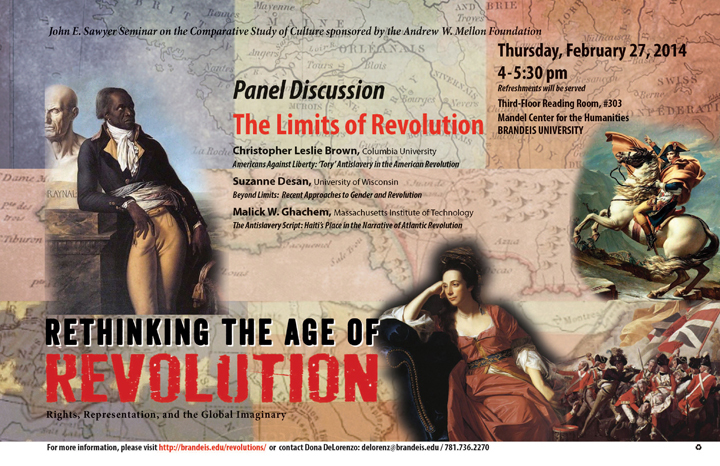 At various points throughout the 2013-2014 academic year, Brandeis University will host public sessions of a Sawyer Seminar entitled “Rethinking The Age of Revolution: Rights, Representation, and the Global Imaginary.” This seminar is directed by Sue Lanser and Jane Kamensky. Looking to the recent past, the legal history of the French Caribbean colonies has been the focus of a number of conferences, including a wonderful event (in which I was privileged to participate) on “The Haitian Declaration of Independence in an Atlantic Context,” organized by Julia Gaffield and Andrew O’Shaughnessy, held this past March at Monticello. And a few years ago, the Institut d’Histoire de la Révolution française held a conference on law and the colonies in the French and Haitian revolutionary era, the program for which is here. As I hear of more such events, I will post to the “Conferences and Lectures” page of this website, above. This entry was posted in Conferences and Lectures and tagged Institut d’Histoire de la Révolution française, legal history, revolutionary legal history on August 25, 2013 by mghachem.